Every January I find my curiosity in the kitchen reinvigorated. 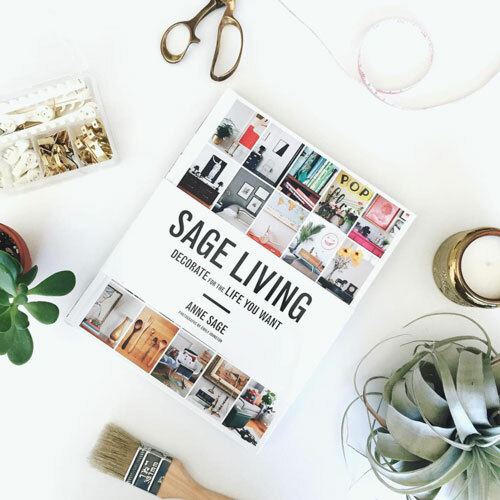 The start of a new year feels like a natural time to test out recipes and find interesting ways to prepare old favorites. Lately I’ve been experimenting with fresh takes on seasonal winter veggies, with fennel being one of my frequent go-to’s because it’s versatile, flavorful, and has the added benefit of a cleansing effect that counteracts any residual holiday heaviness. Fennel has obvious applications in soups and roasts, but it also shines when sliced thinly and served raw—as in this winter fennel salad that looks weekend fancy but that comes together with weeknight ease! We served this at last fall’s Sunday Suppers Sobremesa dinner, and I’ve never received such rave reviews for a salad as I did for this one. 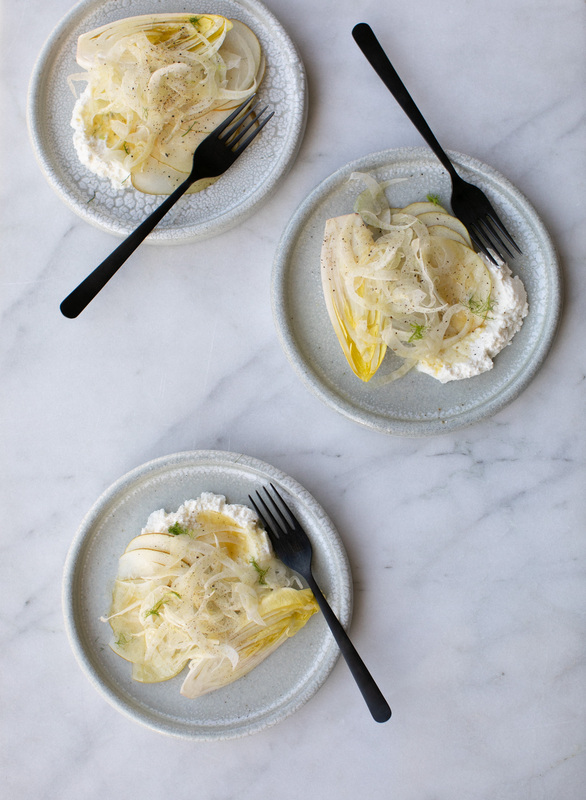 The magic lies partly in the unique combination of ingredients—the crisp tang of the fennel contrasts so nicely with with the sweetness of pears, the creaminess of ricotta, and the bitter bite of endive!—but also in the flavors of the dressing. Fragrant coriander is an unexpected yet touch, and once you taste this vinaigrette you’ll be glad the recipe makes extra because you’ll want to put it on everything! For nicer meals, this salad is simple to assemble and impressive to serve as a beautifully composed plate. You could also omit the ricotta, double the rest of the ingredients, toss all together in a big bowl, and offer it up as a healthful (vegan!) side at a winter potluck. I mean, someone’s got to bring the veggies to balance out the wings and ribs a Super Bowl party, right?! First make the dressing. Toast the coriander seeds in a dry skillet set over medium-high heat until light golden (watch them carefully, they can burn quickly!). Grind the seeds with a mortar and pestle. Combine the ground coriander, lemon juice, sugar, salt and pepper in a bowl and whisk to dissolve the sugar. Slowly whisk in the oil. Next prep the fennel. Prepare an ice bath in a large bowl. Shave fennel using a mandolin and place into the ice bath. This helps to retain the fennel’s crispness. 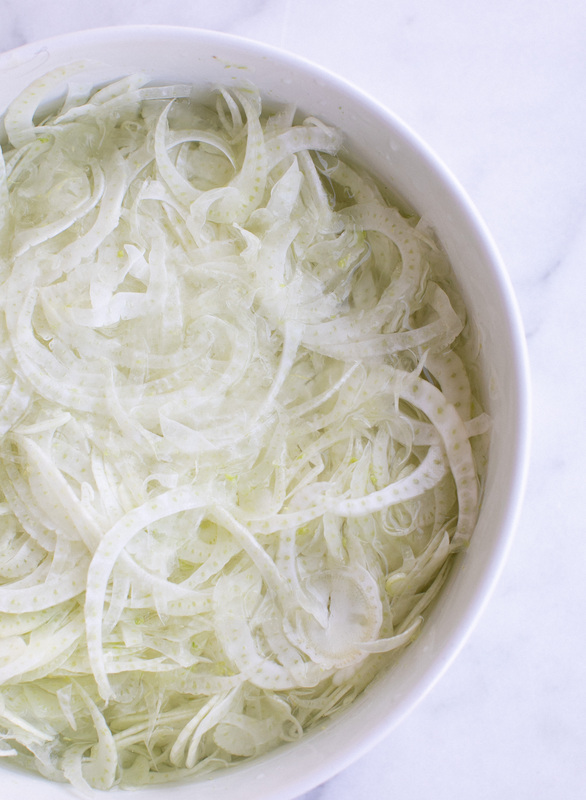 You can even store shaved fennel in the ice bath overnight to use in the salad the next day. When ready to assemble the salads, slice endives in half lengthwise, and slice pears thinly. Place one tablespoon of ricotta on each plate. 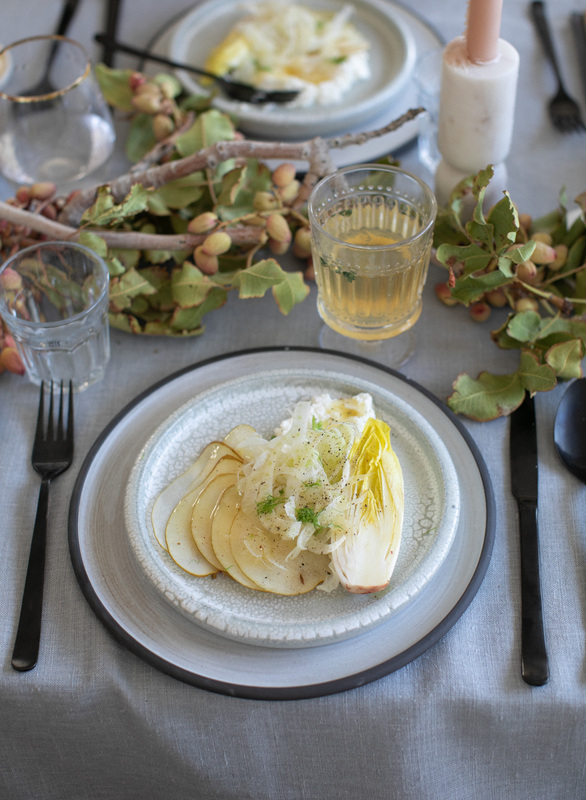 Top with a handful of shaved fennel, half an endive, a few slices of pear, and one fig half. Spoon one tablespoon of dressing over the salad and garnish with a few fennel fronds.